When I decided to replace my ball joints I had some trouble finding detailed information on the axle seal tool that is required to install the new axle seal (F81Z-3254-CB). The tool is required to replace the ball joints on 1999-2003 Ford F250 or F350 trucks. This is the oft referred to "special tool". The tool can be made with common fittings that can be found at a hardware store. Here are some pictures of the tool I came up with. The axle seal (knuckle seal) installs easily with this tool. It just takes a few whacks with a 2 pound sledge. 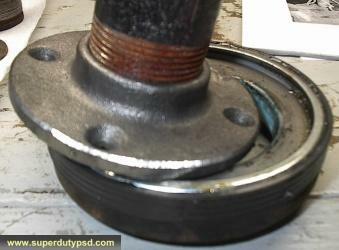 The axle seal needs to seat against the axle. 6695 - Ford Axle Shaft Seal Installer. The advantage of the actual tool, over the home made version, is that it controls where the seal seats, avoiding the possibility of damaging the seal. Pipe wrench, if you want to tighten it up. 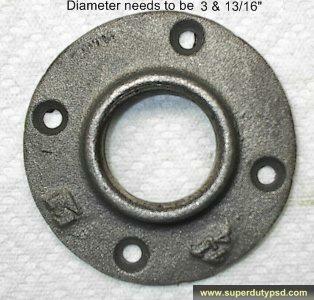 The floor flange must be ground down to a diameter of 3 and 13/16". 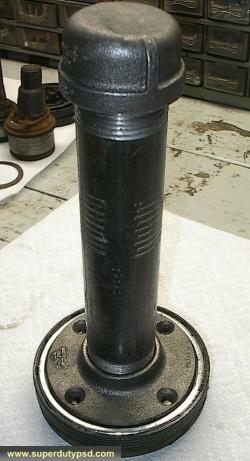 This is done in order to fit inside the axle seal (F81Z-3254-CB). NOTE: Some have reported needing the final diameter different than what is listed here. It is incumbent on you, the reader of this, or any of the other articles on this site to verify your requirements. A good suggestion would be to measure the needed diameter prior to grinding. Note how the floor axle seal (knuckle seal) tool fits inside the axle seal (F81Z-3254-CB). 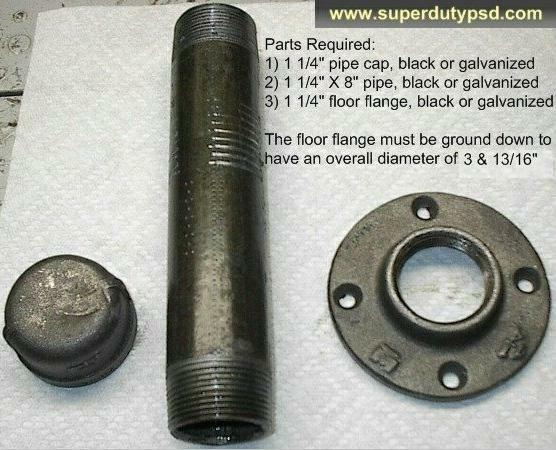 The picture below illustrates how the floor flange must fit inside the axle seal (knuckle seal) (F81Z-3254-CB). The Ford "special tool" part numbers are 205-429 for the installer and 205-199 for the driver. You can buy the "special tool" for about 60$-$80 using the part number OTC 6695.